A spending amendment that would overturn Attorney General Jeff Sessions's narrowing of asylum eligibility got the support of both Democrats and Republicans Wednesday. The amendment, offered by Rep. David Price (D., N.C.), came during discussions over the Homeland Security appropriations bill. The reform, if backed by the full House, "locks in Obama-era expansion of asylum," wrote Center for Immigration Studies Director Mark Krikorian. Under the Immigration and Naturalization Act, individuals seeking asylum in the United States must establish that the threat they face in their home country is a product of their "race, religion, nationality, membership in a particular social group, or political opinion." In the 2014 ruling Matter of A-R-C-G- et al., the Board of Immigration Appeals (the highest "court" in the immigration court system) determined that "married women in Guatemala who are unable to leave their relationship" qualified as a "particular social group," thus rendering them eligible for asylum status. This conclusion was controversial among immigration hawks, who argued that to make victims of domestic crimes qualified for asylum stretches asylum's use beyond reasonableness. Sessions issued a ruling in Matter of A-B-, an immigration court case concerning an application for asylum from a Salvadoran woman seeking to escape her brutally violent husband, in June. 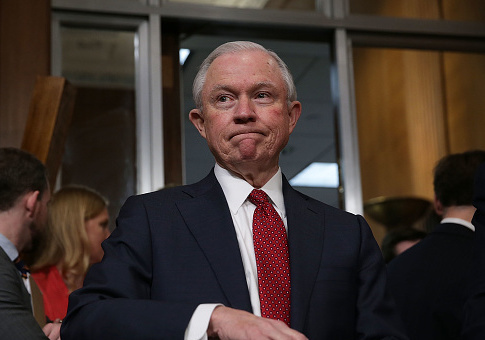 As Attorney General, Sessions has final review of all immigration court cases; in Matter of A-B- he summarily overturned Matter of A-R-C-G-, calling it "wrongly decided." Rather, Sessions wrote, asylum ought to apply to groups—ethnic, racial, etc.—whose identity is specified independent of the persecution they face; and furthermore, should not pertain to harms that a home government is able to rectify. "[Asylum] applicants must establish membership in a particular and socially distinct group that exists independently of the alleged underlying harm, demonstrate that their persecutors harmed them on account of their membership in that group rather than for personal reasons, and establish that the government protection from such harm in their home country is so lacking that their persecutors’ actions can be attributed to the government," Session wrote. However, the Price amendment would prohibit funds from being used to implement Sessions's decision. More specifically, it would block the use of any funds appropriated for Homeland Security to enforce the memo from U.S. Citizenship and Immigration Services implementing Sessions's ruling in Matter of A-B-. The House Appropriations committee passed the proposal by a voice vote, aided by the support of Homeland Security Sub-Committee chairman Rep. Kevin Yoder (R., Kan.). "I believe that [domestic abuse] should be a factor in an asylum claim, and USCIS should at least be able to look at those issues in an asylum claim," Yoder said prior to the vote, citing his mother's labors as a social worker in shaping his opinion. It is unclear how many asylum claims are actually valid. Sessions and Secretary of Homeland Security Kirstjen Nielsen have both claimed that 80 percent of asylum claims made at the Southwestern border are illegitimate. Misuse of "credible fear" asylum claims—the sort that Sessions's order was meant to crack down on—is rampant, according to analysis from the Center for Immigration Studies. The Price amendment has already attracted criticism from other Congressional leaders on immigration. Sen. Tom Cotton (R., Ark.) took to Twitter to slam his House colleagues for their vote. "Why is @HouseAppropsGOP voting to undermine AG Sessions's asylum reforms & throw open our borders to fraud & crime?" Cotton wrote. "The amendment they adopted today is the kind of thing that will kill the DHS spending bill. I hope the full committee removes it." This entry was posted in Issues and tagged Illegal Immigration, Immigration, Jeff Sessions, Justice Department. Bookmark the permalink.